Campaign created by Amsterdam based Ideas Company WE ARE Pi, in collaboration with Pretty Green and mSix. 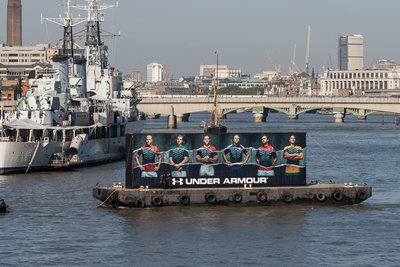 Under Armour and Amsterdam based ideas company WE ARE Pi yesterday launched its nationwide Armour campaign, running across retail, social, digital and out-of-home channels, and kicked off by a unique event on the River Thames. Campaign created by Amsterdam based Ideas Company, WE ARE Pi. LONDON, UK (September 8, 2015) – Under Armour and Amsterdam based ideas company WE ARE Pi yesterday launched its nationwide Armour campaign, running across retail, social, digital and out-of-home channels, and kicked off by a unique event on the River Thames executed by Pretty Green. The integrated campaign highlights the performance products that unite some of the world’s top rugby players. The 30m long vessel transported a huge image of Welsh Rugby Union (WRU) players Jamie Roberts and Leigh Halfpenny, accompanied by fellow Home Nations representatives James Haskell (England), Jordi Murphy (Ireland), Drew Mitchell (Australia) and Canadian Jamie Cudmore, displayed across eight shipping containers. 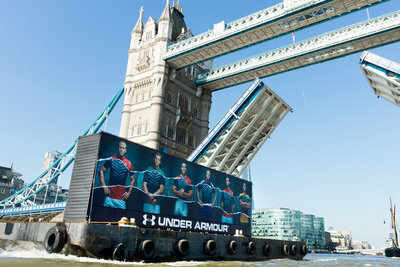 As it passed down the Thames and under Tower Bridge, the mural - which originally showed the players in country colours - was ‘ripped’ to reveal the Armour baselayer. The creative demonstrates Under Armour's commitment to making all athletes better, regardless of nation or team represented. Under Armour Director of Marketing EMEA, Christopher Carroll, said: “We partner with the World’s top talent in rugby and our mission is to provide our athletes with cutting edge gear to help them train and perform at their best." WE ARE Pi has created the campaign using powerful portraiture shot by French photographer Denis Rouvre. The campaign will run across OOH, retail and online. Founded in 2011, WE ARE Pi is an Amsterdam based international Ideas Company that delivers brand storytelling across communication and experiences, for clients including; Coca-Cola, LEGO, Wrangler, Kipling, Under Armour, TED Conferences, and ABB. Under Armour is the Technical Partner to the national teams of Welsh Rugby Union, Georgia and Canada, and will provide match day kits for each team, fitted with the most advanced technology available, including ArmourGrid fabric, strategic stretch paneling and a tight stretch fit.